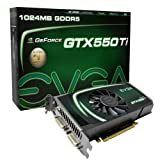 Introducing the latest entry in the GeForce GTX 500 series product lineup, the EVGA GeForce GTX 550 Ti. Get your PC ready to dominate this year's blockbuster game titles like Crysis 2 and Duke Nukem Forever. And with up to 6x the performance of previous generations graphics, you know you are well armed for the future. 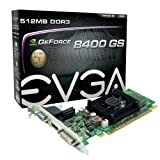 EVGA GeForce 8400 GS 512 MB DDR3 PCI Express 2.0 DVI/HDMI/VGA Graphics Card, 512-P3-1300-LR - $29.99 & eligible for FREE Super Saver Shipping!